A watchdog has endorsed a new scheme under which a bone marrow-cancer drug's manufacturers would refund the NHS if a patient did not respond to treatment. The National Institute for Health and Clinical Excellence is recommending multiple myeloma patients in Wales and England should get Velcade on the NHS. But it said the NHS should pay for the drug, which costs about £18,000 per patient, only when it worked. The scheme, the first of its kind, was proposed by drugmaker Janssen-Cilag. It could signal a way for many more treatments to be made available on the NHS, which has been struggling to cope, with limited funds, to provide a raft of expensive new cancer treatments in particular. 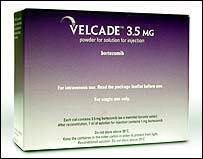 Life expectancy for multiple myeloma patients is three to five years, but in trials Velcade has been shown to extend that by many months. One trial was so promising, it was halted a year early. Under the terms of the NICE recommendation, patients showing a full or partial response to the drug after a maximum of four cycles of treatment would be kept on it, with the treatment funded by the NHS. However, patients showing minimal or no response would be taken off it - and the costs would be refunded by the manufacturer. The final decision on whether to put the refund scheme into practice rests with the manufacturer and the Department of Health, with final NICE guidance expected in October. Andrew Dillon, NICE chief executive, said: "We are aware of the challenge that the NHS faces in ensuring that patients can access expensive, but potentially effective, treatments for life-threatening conditions such as cancer. "If the drug's manufacturer accepts the proposals we are consulting on today, it will mean that when the drug works well the NHS pays but when it doesn't the manufacturer should bear the cost. "All patients suitable for treatment will get the chance to see if the drug works well for them." Initial draft NICE guidance recommended that Velcade should not be made widely available on the NHS. However, the watchdog changed its mind following an appeal by the manufacturer - and its suggestion of a refund scheme. Eric Low, chief executive of the charity Myeloma UK, said: "We welcome the fact that these conversations have resulted in a creative way to ensure that this important cancer drug can be made available to patients. "However, we now need to carefully consider the details of the draft recommendation as we have concerns that it may exclude some patients who could benefit." Harpal Kumar, chief executive of the charity Cancer Research UK, praised NICE for recommending an "innovative approach". "Pharmaceutical companies with confidence in the new treatments they are developing should not be frightened of schemes aimed at pricing treatments according to their benefit. "Enabling the NHS to get value out of the money it spends on drugs will improve its ability to afford new treatments for cancer patients."